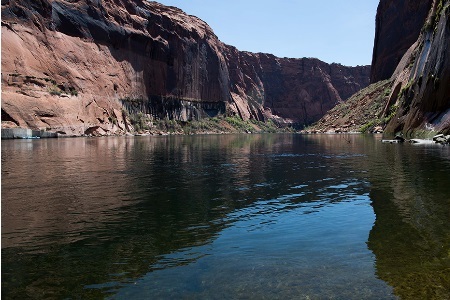 The Bureau of Reclamation has released updated 5-year probability-based planning model projections for future Colorado River system conditions, which underscore the ongoing impact of record dry conditions across the basin. With spring and summer inflow to Lake Powell at only 36 percent of average, this year is one of the driest years in the past 19 years, which is the driest 19-year period in recorded history and one of the driest in the past 1,200 years. These projections show increased risk of declining reservoir elevations over the next 5 years. Specifically, the projections include a 57 percent likelihood for Lower Basin shortage in 2020—an increase from 52 percent from the April results. Furthermore, recently published results from the August 2018 24-Month Study operational model showed that another dry year like 2018 could drop the elevation of Lake Mead by 20 feet or more by mid-2020. These probability projections include considerable uncertainty as the long-term hydrologic assumptions used may not fully represent the possible future inflows that could occur. The Colorado River Simulation System planning model used for these projections is an important long-term planning tool for water managers across the basin. Conversely, the 24-Month Study operational model—which was most recently released on August 15—produces a single projection of reservoir conditions based on current inflow forecasts and reservoir conditions. Projections from the August 24-Month Study were used to determine annual operations for Lake Powell and Lake Mead for 2019. While Lake Mead is near the level that would—for the first time—trigger mandatory cuts to Lower Basin water deliveries, it will continue to operate in normal conditions through calendar year 2019. Annual operations for 2020 will be determined in August of 2019. The most current 5-year probabilistic projections of future Colorado River system conditions are available at https://www.usbr.gov/lc/region/g4000/riverops/crss-5year-projections.html. The August 2018 24-Month Study operational models are available at: https://www.usbr.gov/uc/water/crsp/studies/index.html or https://www.usbr.gov/lc/region/g4000/24mo/index.html.